Inspired by and drawing from the Writers Resist movement and protests held in January 2017, editors Nathaniel Popkin and Stephanie Feldman brought together a diverse group of impassioned voices investigating contemporary American politics, society, and culture. Our Writers House gathering in the Class of 1942 Garden will feature readings from eleven contributors: Cynthia Arrieu-king, Cynthia Atkins, Herman Beavers, Stephanie Feldman, Airea D. Matthews, Liz Moore, Cynthia Dewi Oka, Nathaniel Popkin, Marc Anthony Richardson, Carlos José Pérez Sámano, and Fran Wilde. CYNTHIA ARRIEU-KING is an associate professor of creative writing at Stockton University and a former Kundiman fellow. Her books include People Are Tiny in Paintings of China (2010) and Manifest (2013), winner of the Gatewood Prize, selected by Harryette Mullen. She edited the “Asian Anglophone” edition of Dusie in 2016. CYNTHIA ATKINS is the author of Psyche’s Weathers (2007), In The Event of Full Disclosure (2013), and a manuscript in progress, “Still-Life with God.” Her work has appeared or is forthcoming in Alaska Quarterly Review, Apogee Journal, Bomb, Cleaver Magazine, Del Sol Review, Diode, Entropy, Expound, the Florida Review, Green Mountains Review, North American Review, Seneca Review, Sweet: A Literary Confection, Tampa Review, Thrush, Tinderbox, and Verse Daily. Her poems have been nominated for the Pushcart Prize, and she has received prizes and fellowships from Bread Loaf Writers’ Conference and Writers at Work. She teaches creative writing at Blue Ridge Community College and lives on the Maury River in Rockbridge County, Virginia. HERMAN BEAVERS is professor of English and Africana studies at the University of Pennsylvania, where he teaches courses in African American literature and creative writing. His books include a scholarly monograph, Geography and the Political Imaginary in the Novels of Toni Morrison (2018 and a chapbook, Obsidian Blues (2017). STEPHANIE FELDMAN is the author of the novel The Angel of Losses (2014), a Barnes and Noble Discover Great New Writers selection, winner of the Crawford Award, and finalist for the Mythopoeic Award. Her short stories and essays have appeared in or are forthcoming from Asimov’s Science Fiction, Electric Literature, the Magazine of Fantasy and Science Fiction, the Maine Review, the Rumpus, and Vol. 1 Brooklyn. She lives outside Philadelphia with her family. AIREA D. MATTHEWS is the author of the poetry collection Simulacra (2017) and recipient of the 2016 Yale Series of Younger Poets prize. Her work has appeared in the Rumpus, Best American Poetry 2015, American Poet, and elsewhere. She received the 2016 Rona Jaffe Foundation Writers’ Award and was awarded the Louis Untermeyer Scholarship in 2016 from Bread Loaf Writers’ Conference. Airea is working on her second poetry collection, “Under/class,” which explores poverty. She is an assistant professor at Bryn Mawr College. LIZ MOORE is the author of the novels The Words of Every Song (2007), Heft (2012), and The Unseen World (2016). Her short fiction and creative nonfiction have appeared in such venues as Tin House, the New York Times, and Narrative Magazine. A winner of the 2014 Rome Prize in Literature, Liz lives in Philadelphia, where she is writer in residence in Temple University’s MFA program in creative writing. CYNTHIA DEWI OKA is a poet and the author of Salvage (2017) and Nomad of Salt and Hard Water (2016). A three-time Pushcart Prize nominee, her poems have appeared in American Poetry Review, Kenyon Review, Guernica, the Massachusetts Review, Black Renaissance Noire, Painted Bride Quarterly, and elsewhere. Her work appears in Best of Kweli (2017) and Women of Resistance: Poems for a New Feminism (2018), among other anthologies. She has received the Fifth Wednesday Journal Editor’s Prize in Poetry, scholarships from Voices of Our Nations (VONA) and the Vermont Studio Center, and the Leeway Foundation Transformation Award. Originally from Indonesia, she currently works as an organizer with immigrant communities in Philadelphia. NATHANIEL POPKIN is the author of three books of nonfiction, including Philadelphia: Finding the Hidden City (2017), and two novels, Lion and Leopard (2013) and Everything Is Borrowed (2018). Founding co-editor of the Hidden City Daily and fiction review editor at Cleaver Magazine, his work has appeared in the Wall Street Journal, Tablet, Kenyon Review, Rain Taxi, Public Books, LitHub, The Rumpus, and The Millions. MARC ANTHONY RICHARDSON received his master of fine arts degree from Mills College. He is an artist and writer from Philadelphia. Year of the Rat (2016), his debut novel, was the winner of the 2015 Ronald Sukenick Innovative Fiction Prize. In 2017, it received an American Book Award from the Before Columbus Foundation, founded by Ishmael Reed. He also was the recipient of a Zora Neale ] Hurston/Richard Wright fellowship and a Vermont Studio Center residency. Currently, he is writing “The Messiahs,” a work of speculative fiction that takes place in a possible America where you can take on the capital punishment of a relative, a derivative of the Native American blood law. CARLOS JOSÉ PÉREZ SÁMANO is a literary fiction and nonfiction author and a teacher of creative writing workshops in Mexico, the United States, Kenya, and Cuba. He has four published books in Spanish and is the recipient of the Ad Zurdum Publishing House’s Best Seller award. His work has been featured in more than twenty international magazines, including Fredericksburg Literary and Art Review, Errr Magazine, Quinqué, Poetry in Common, and Cultura Colectiva. He is pursuing a master of fine arts in creative writing and a master’s in publishing at Rosemont College. Find him on Twitter @carlosjoseperez. FRAN WILDE is the author of several novels and short stories that have been nominated for Nebula Awards and a Hugo Award, including her Andre Norton Award– and Compton Crook Award–winning debut novel, Updraft (2015); its sequels, Cloudbound (2016) and Horizon (2017); and the novelette The Jewel and Her Lapidary (2016). Her short stories appear in Asimov’s Science Fiction, Tor.com, Beneath Ceaseless Skies, Shimmer, Nature, and the 2017 Year’s Best Dark Fantasy and Horror. She writes for publications including the Washington Post, Clarkesworld Magazine, io9, and GeekMom. You can find her on Twitter, on Facebook, and at http://www.franwilde.net. About Who Will Speak for America? Published July 2018 by Temple University Press. 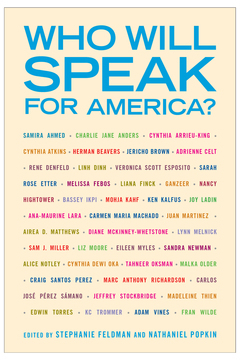 The editors and contributors to Who Will Speak for America? are passionate and justifiably angry voices providing a literary response to today’s political crisis. Inspired by and drawing from the work of writers who participated in nationwide Writers Resist events in January 2017, this volume provides a collection of poems, stories, essays, and cartoons that wrestle with the meaning of America and American identity. Who Will Speak for America? inspires readers by emphasizing the power of patience, organizing, resilience and community. These moving works advance the conversation the American colonists began, and that generations of activists, in their efforts to perfect our union, have elevated and amplified. All royalties will benefit the Southern Poverty Law Center.